Here is what doesn’t matter in work and life: talent. Here is what does matter: dependability, integrity, delivery. Want your boss to give you more leeway? Do what you say you are going to do. Do it with the +1 Rule. Do it earlier than expected. Then, help other people do what they said they were going to do. Creativity is — solving problems, fashioning products, or defining new questions in a way that is novel. The Arts are — the various branches of creative activity, such as painting, music, literature, and dance. What we are NOT talking about here is turning your accounting numbers into a song. What we ARE talking about is a position with the freedom and flexibility to allow for your personal creative genius. Look at that definition of creativity again. If you are not in a role in which you can solve problems, fashion products, or define new questions, MOVE. And get Starbucks, not the gas station stuff. A funny thing happens to human beings when we can’t see other humans. We start to believe they aren’t real. How else do you explain Subway having a recipe for bread which included yoga mat material? Or the Peanuts Corporation of America knowingly releasing contaminated food, causing an outbreak of Salmonella? Who would consciously do that to another person? This is what happens when people become numbers. Humans are not biologically wired to understand people we can’t see. We need the facial expressions and body language to know what another person is really all about. We need their face and their vocal tone. I can’t help but be reminded of Milgram’s psychological experiment — where participants were told by an authority to press a button which would “shock” a person in the other room. Almost everyone followed orders, even after it appeared they were doing great harm to the other person. Would these results have been the same if the victim were not behind a wall? What does this have to do with winning your boss’s favor? Well, if you both work in the same physical office — nothing. If you or she works remotely at least a little bit — everything. Do everything in your power to make your boss hear your voice or see your face as often as possible. Without human context, you become Employee #47573. It becomes all too easy to shoot down your ideas. Later, it becomes all too easy to fire you. People are everything. Relationships are everything. By the way, the difference between a brown-noser and a successful worker is that one of them is genuine. Be genuine. c) You don’t know how to make saying “yes” easy for your boss. The Trail Run technique is my favorite example of this last option. The family cuddles, falls in love, and scoops up the pup. This sentence is your magic bullet. No manager ever has enough time or money. What is a person to do? Answer — have people cover areas they aren’t necessarily good at or responsible for. I am sure there are exceptions to this rule. I haven’t seen any yet. Whenever you take a creative position, your goal on the team is not to do experimental work or play in Illustrator all day or soak up company funds to learn new things. Your goal is to achieve a result. What result? I don’t know. You will have to ask your boss. Once you find out, do all that is required to reach it. Even (especially) the stupid stuff nobody else will do. Oooooh, this is my favorite. In Jim Collins’ classic business book — Good to Great — he points out that Level 5 Executives (a common element in all great companies) have the ability to surround themselves with people who would bitterly argue about what the right decision was. 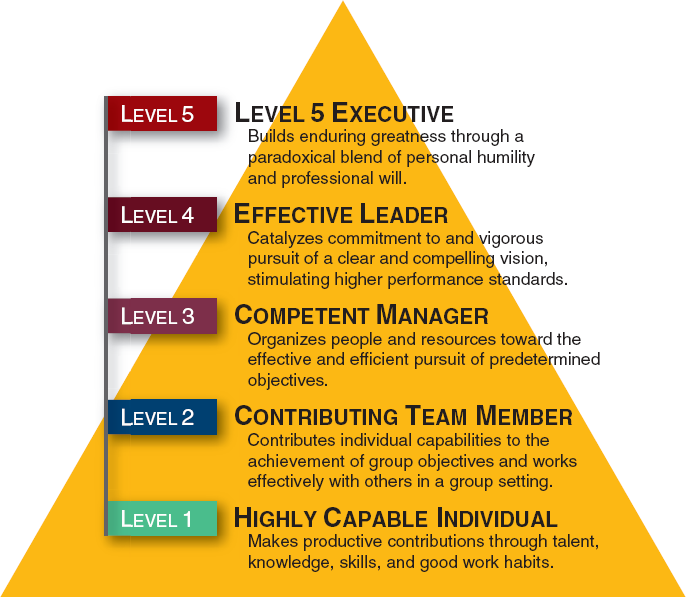 Based on the hierarchy, Level 1s & 2s need to have opinions of their own, as opposed to being warm bodies who smile and nod. When you always agree with the boss because they are the boss, you are forever a functionary. Disagree, and you are suddenly an autonomous human being, capable of visualizing and managing her own projects. (PS. — Some bosses don’t like disagreement. There’s a simple process for dealing with them). With the possible exception of Pablo Picasso, every creative person of note had a sounding board. This person would tell the artist how it is. The artist might pout for a while, but would ultimately make changes to improve his work. Oh, and wait! I just remembered Pablo Picasso had George Braque, without whom cubism probably would not exist. In a modern work environment, art-based professions are push and pull, not a genius with a thousand helpers. Even if you choose not to implement it, accepting feedback with grace will do wonders for work relationships. By the way, there are probably plenty of creative people who stubbornly clung to their pure vision and didn’t listen to anyone. You just don’t know their names. Oh, you thought you got a pass on this after you’ve established your reputation? Nah. Here’s what happens in a corporation: You don’t get paid for what you are doing. You get paid for what you have already done. This often makes it easy to rest after reaching a certain level of success. An army of inflated egos runs rampant in Corporate America. Why do you think there are many more amatuer creative people than there are professionals? There are probably plenty of reasons. Life weeds out those who are simply less talented. Some don’t want to turn the thing they love most into a job. Others may just lose interest. It is one thing to sit alone in your room, doodling a masterpiece on a napkin. It is quite another to generate a 50s-themed advertisement that uses pink and says the line “we’ll take you back.” You will be creating this for a board of five different people, all who have different opinions which must be incorporated into the piece. And it still has to look good (the hard part). Amatuer creatives can bring their own vision to life. Professionals can do it for other people. You might be interested to know I’m giving away a copy of my first book — The Creative’s Curse — whenever you pick up a copy of my latest book — The Unstoppable Creative.